Specialising in Peking and Szechuan cuisine, this is a relaxed, spacious and airy restaurant. 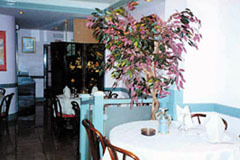 Tastefully decorated, this air conditioned restaurant is ideal for both lunchtime business and evening entertainment. Attractive alcoves provide a cosy, intimate atmosphere. Specialising in Peking and Szechuan cuisine.